Three days, three podiums! 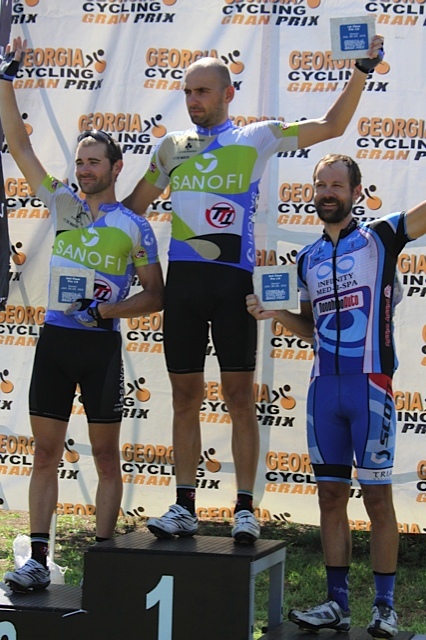 This podium was for 3rd place in the 5 day stage race overall. Unfortunately I didn’t see anyone with an iphone taking a picture of the podium – but there were a lot of people taking pictures with regular digital cameras so hopefully I’ll be able to post a podium pic in the next day or two. UPDATE: Joey Rosskopf (Team Type 1) passed along this podium pic (and the one at the bottom of the post) from Barbara Dowde. Thanks Joey and Barbara! This race played out very similar to last year’s race, but the way I personally raced the race was completely different this year – and I ended up in the exact same position! Go figure. Last year a late race break of 15 formed when I bridged up with a small chase group to an original break of 10 riders that had gotten away a bit earlier. That break of 10 riders was an amalgam of smaller moves. A small break emerged from our group and I ended up something like 6th or 7th in the sprint from the large break to take 9th in the race. I was nursing a groin injury so I decided to start at the back of the race and wait as long as possible before doing anything. This year, I was also nursing a bit of a groin injury from my cramps at the end of the Covington crit – but it wasn’t as bad as last year so I decided to be a bit more aggressive this year. 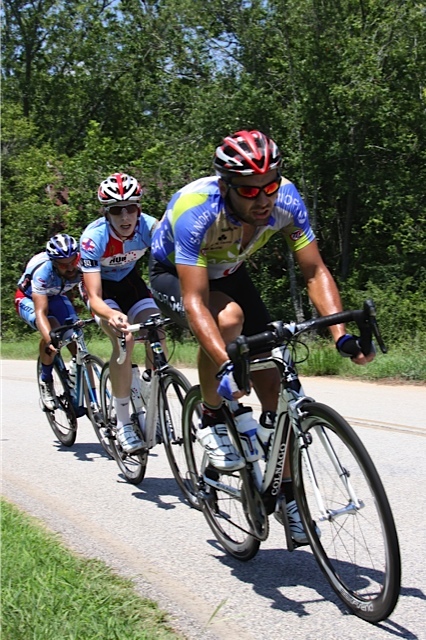 I went with several of the early moves and eventually made it into a two-man chase group (me and Alexy Schmidt from Team Type 1) … we were chasing Alexy’s teammate Joey Rosskopf so Alexy wasn’t happy that I wasn’t contributing very much to the chase. I was pretty tired, though, after covering so many of the TT1 attacks and breaks from the first 10 laps of the race. So as the field was closing in on us, it looked like Alexy had given up – but instead he had only eased up for a second and then attacked really hard to finish the bridge by himself as I drifted back to the pack. I was really tired at this point so I drifted back to the very back of the large field. It was much easier but I couldn’t respond to any moves. A chase group of about 6 or 7 riders emerged from our field and started to put some serious time into what was left in the field – eventually merging with Joey and Alexy. I still sat at the back resigned to just try and do whatever I could in the field sprint to get the 5 points I needed to make it into 3rd position for the general classification. Then a chase group formed, and I decided that I had to at least try so I attacked really hard from nearly the back of the pack because a nice string of coincidences led to a strung out pack that wasn’t going very fast. I took the momentum of the group and used it to slingshot myself sheltered from the wind all the way across to this chase group of 5 or 6 riders. All of the attacking that had been going on in the field had dramatically reduced the gap to the lead group – so when I bridged to the chase group, the lead group was less than 15 seconds in front of us. Unfortunately, the momentum had gone out of the chase group. I went immediately to the front and ramped the speed back up, but the field was closing in on us fast when Jeff Mcgrane (Friends of the Great Smokies) came across the top of the feedzone hill absolutely drilling it down the hill into the course’s sharpest turn. This brought out the people who were willing to work in the chase group and we had about five or six guys killing it with three laps to go. We had nearly caught the leaders by halfway through the last lap – but they must have ramped up for the final sprint which meant that we were sprinting for ninth place in our chase group. Jeff led out the sprint, and I was able to come around him at the line to take ninth in the race. Ahead of us – Alexy Schmidt took the sprint win followed by Joey Rosskopf (TT1) in second and Emilio Asconeguy (Rossetti Cycling Team) in third. This gave me enough points to move up to 3rd in the overall general classification for the five days of racing – definitely my highest placing in such a long race (5 days). Very happy with the outcome, the training, and racing with everyone! 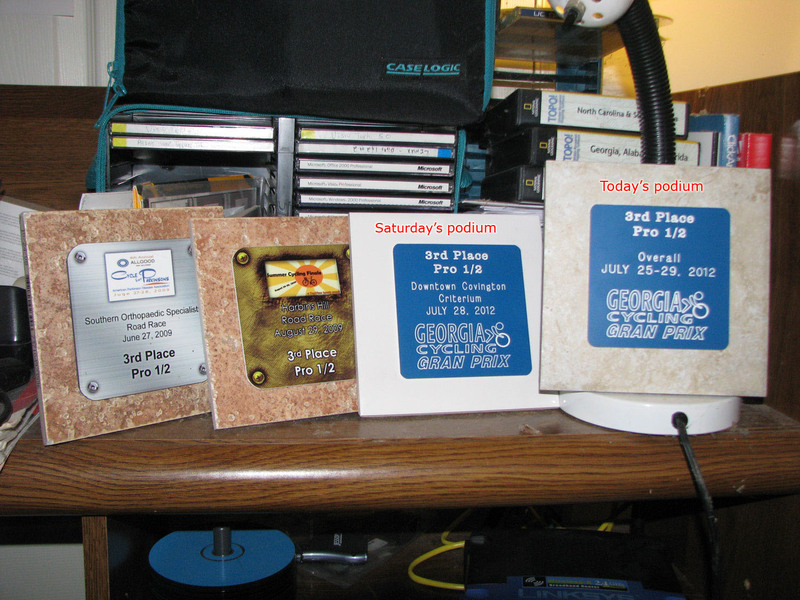 This entry was posted in Racing and tagged circuit race, podium on July 29, 2012 by kartoone. Well done, love! Sorry I missed cheering you on. Surely would have been a top-step if I had been there!! Looking forward to LEADVILLE and a road trip to CO! Love you so much! Good job. Sorry about your pulled groin injury but it sounds like you are listening to your own body and strengths. Keep it up and you will surly move into 1st. Where do you do most of your training?